The main objective department of administration and maintenance activity of Igor Sikorsky Kyiv Polytechnic Institute is maintenance of material and technological base of the University in proper operating condition for the creation of the necessary conditions of educational and scientific activities for students and university employees. The total area given for Igor Sikorsky Kyiv Polytechnic Institute in constant use, works out 146 hectares. On the area of ​​111 hectares 35 academic buildings, three administrative and economic buildings (№№32, 33, 34), 20 dormitories, 6 houses are locted. 35 hectares occupy 4 recreation centers (OC "Lighthouse" WTO "Polytechnic" TV "Pine" TT "Globe"). Total area of ​​material and technological base of Igor Sikorsky Kyiv Polytechnic Institute is about 550 thousand square meters, including educational buildings and objects of economic activity - 408 thousand square meters and 146 thousand square meters of student dormitories. Energy audit is provided by 105 commercial units of metering, 81 cold water counters, 56 heat meters, located in the 21st heating unit. 24 electrical substations and a distribution substations provided with 51 voltage transformer, provide a continuous supply of electric power. I'll tell you about the results of the department in the following areas: repair and refurbishment work , maintenance of the material base of campus, utilities (consumption of heat, water, electricity and natural gas), energy conservation, obtaining of approval documents. The total amount of funds used in 2015 to carry out repair work on the University ojects amounted to 21.02 mn UAH (in 2015 - 15.9 million), including capital repair – 5,06mn UAH. The cost structure of the repairs was the following: general construction works - 13.3mn UAH; sanitary works - 2 million; electrical work - 1.5 million; landscaping - 3 million; roofing - 0.6 million; external engineering networks - 0.7 million. The volume of repair works between the executive units in 2016 were divided in a following way: Production and operational center - 12 million UAH (in 2015 - 8.18 million UAH); foreign contractors - 6.9 million (in 2015 - 6.26 million UAH), campus on students’ own - 1.7 million (in 2015 - 1.16 million UAH), using units own recourses - 0.4 million (2015 - 0.3 million). The cost of repair work, conducted in University buildings, was 10 million UAH, of which 7 million - centralized fund of 3 million - funds of units. Among the units that completed the greater part of repairs at their own expense, these ones should be noted: FIVT Center of Physical Education and Sport, FSP ISZZI, FMM, CMA. Considering the absence of adequate funding and the shortage of materials there were following priority works made in 2016. Department of electrical supervisor: installation and repairs and permanent repairs in the academic buildings of the university, repair of exterior lighting; emergency repairs of 10 kV cable networks; measuring insulation resistance and grounding in dormitories and academic buildings. Department of chief engineer: replacement of the external input plumbing in buildings №№18, 22, 35 and in the Scientific and Technical library; house water plumbing and sanitation in the school building number 22, repair of sanitary conveniences of three academic buildings (№№18, 20, 31) and canalization and heating of corps №31, repair the heating system of educational building №1, replacement of sewers, water supplies of educational buildings number №5 and №32 and heating of building, scheduled maintenance of thermal units and replace of defective valves, replacing house water plumbing (pumping), outside water service input to the academic building №2 and heating pipes on the ground floor of the building №2 and in the building №22. Completed works totaling 800 thousand UAH. Fire Protection Services: system of automatic fire alarm was restored to a serviceable condition in two buildings (№№ 18, 27) and the recreation of the CCTV "Polytechnic", carried out inspection of internal fire water supply, fire extinguishers and purchased 24 fire extinguishers 470 were reloaded, 15 outdoor fire hydrants were tested, there was made insulation of resistance measurement power and lit-term electricity network in dormitories, academic buildings and structural units of the institution. Department of maintenance of elevators: expert inspection and repair of nine elevators took place in buildings of academic buildings №№2, 5, 21, 22, NTB, capital repair of the elevator took place in the building №22. Campus of Igor Sikorsky Kyiv Polytechnic Institute consists of 20 dormitories, which are home to about 13 thousand students. During 2016 in the campus there were organized and implemented a set of measures aimed to improve the living conditions for students. There were completed major repairs in six dormitories (№№4, 17, 18, 19, 20, 21), reconstruction of heat supply in individual hostel number 15, performed cosmetic repairs in 11 hostels (№№ 3, 6, 10, 13, 14, 15, 16, 17, 19, 20, 22), coating with asphalt of pavements and surrounding areas of six dormitories (№№ 11, 12, 16, 17, 20, 21), installed video observing systems in six dormitories (№№ 1, 4, 12, 15, 17, 20), windows were partially changed on plastic ones in eight dormitories (№№7, 8, 10, 15, 16, 18, 19, 21), made repairs and put into operation elevator in the dormitory №19, work done to replace the elevator control panel in the dormitory №18, conducted elevator replacement in the dormitory number 16. Cash inflows to campus by means of students that pay for living in dormitories. This year, they amounted to 39 849 thousand UAH. Also in 2016 campus received 300 thousand UAH from general fund. The campus maintenance expenses in 2016 amounted to 59.4 million UAH. Including: repair works - 8.4 million; purchase of hospital linen and housewares - 1.9 million UAH; utilities - 34.8 million UAH; general running costs and others - 6.7 million UAH, budgetary and payroll accrual - 5,960,000 UAH. Utilities expenses are a significant part of the budget of our University. In 2016 energy tariffs continue to increase. Price of electricity increased by 56.6% for dormitories and 31.2% for academic buildings; cold water by 42.1% and heat energy by 117.2% for dormitories and decreased by 7.8% for academic buildings. Growth of tariffs led to the total cost of energy resources in 2016 to be increased by 37.3% compared to last year and amounted to 98.6 million UAH (in 2015 - 71.8 million UAH). cold water - 1.14 million cubic meters, worth 11.3 million UAH (in 2015, 1.15 million cubic meters, amounting to 9.4 million UAH). natural gas - 87 thousand cubic meters, amounting to 611.6 thousand UAH (in 2015 88.6 thousand cubic meters, amounting to 501.5 thousand UAH). In 2016 compared to 2015 increased consumption of thermal energy by 13.5%, electricity - by 1%. At the same time the consumption of cold water reduced by 0.8% and natural gas by 1.8%. Heat consumption. Costs for thermal energy consumption in 2016 amounted to 64.6% of total utility costs (in 2015 62.3%). The increase in thermal energy consumption compared to 2015 is 5786 Gcal (excluding residential buildings). The main consumers of thermal energy are campus - 45.9% (43.6% in 2015) and education buildings - 48% (50.8% in 2015). Growth in heat consumption is mainly associated with a decrease in the average ambient temperature during the heating period of 2016, compared to 2015 year. Power consumption. Costs for electricity consumed in 2016 accounted for 23.3% of total utility costs, in 2015 - 23.9%. The excessive electricity expanses compared to last year at the university is 284,1 thousand kW/year (excluding residential buildings). 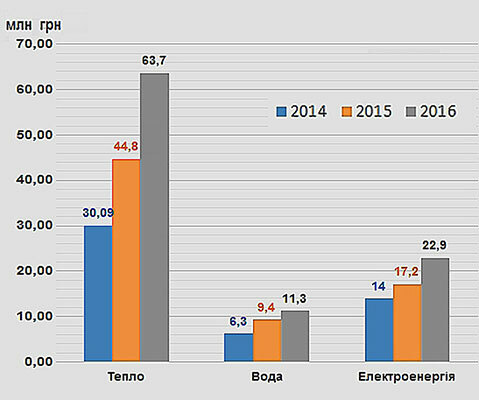 The main consumers of electrical power were campus - 48.98% (49.99% in 2015), academic buildings - 41.02% (41.6% in 2015). Among the buildings where there was observed the greatest increase in electricity consumption for 2016 are academic buildings №№2, 24, 27, 30 and building №32 (center of student nutrition) in which over-year comparison from 2015 is 200.6 thousand kW/year - 70.6% of the total overrun of the University. The main reasons power consumption increasing is the use of heaters during the heating season, installing new equipment in CSN of University and other buildings, as well as the increasing in the number of air conditioners in buildings. Water consumption. Consumption of cold water in the whole university decreased by 0.8%. Costs for cold water consumption in 2016 amounted to 11.5% of the total cost of utilities (in 2015 - 13.08%). In 2016 in Igor Sikorsky Kyiv Polytechnic Institute Institute installation of energy efficient windows went on. During 2016 there were installed: in the academic buildings - 799.7 square meters of windows in the amount of 1.5 million UAH (in 2015 - 331.6 1 square meters of windows in the amount of 2.8 million UAH) in the dorms - 685.6 square meters in the amount of 1, 2 million (2015 - 874.88 square meters in the amount of 1.7 million UAH). In 2016, continued the replacement of incandescent lamps to LED lamps and fixtures, which began in 2014 under the project of "Development and implementation of an integrated LED lighting system NTUU "KPI". To save energy there were installed 51 thermal screen in six academic buildings (№4 - 3 pcs., №5 - 4 pcs., №7 - 29 pcs., №18 - 7 pcs., №19 - 6 pcs., №20 - 2 pcs.). Also there was temperature control set in heating systems of 11 educational buildings (№№1, 4, 11, 12, 15-17, 19, 22, 23, 35). The university also established an automated system of control and accounting (АСКОЕ), the main advantage of which is the ability to control electricity usage in real time, which enables rapid repairs in case of malfunction of the electricity meters. The system is set in 9 heat substations, accounting for 12 educational buildings is being kept. Existing heating system of university needs reconstruction because it has a number of drawbacks, including low efficiency, slow circulation of the coolant. remove obstacles to the heat input from radiators (tables, cabinets, etc.). insulate doors, to install on the front door hold-open devices. We also recommend after finishing workday to turn off all electronic devices and the light when leaving the classrooms. Division of maintenance and operation of elevators received Permission for operation and maintenance of elevators of Igor Sikorsky Kyiv Polytechnic Institute by 2020. Division Chief Energy received permission to perform testing of electric equipment of power line (the voltage to 10 kV inclusively) by 2019. Service Energy received Permission for special water use that issued for up to 2019. Also in 2016 there was signed the Treaty on the sharing of power grids between our University and PJSC "Kyivenergo" in which the latter is obliged to compensate University 332.5 thousand UAH during 2017. I would like to emphasize that the PJSC "Kyivenergo" recompensed the previous 220 thousand UAH. There will be continued works on the planned repair and upgrade of buildings of Igor Sikorsky Kyiv Polytechnic Institute to increase their efficiency and improve performance characteristics. Among these works are replacement of 10 kV cable line, replacement of power converter in the 1st heat supply station, laying 0,4 kV cables for seven academic buildings, repairing of heating of 10 academic buildings (№№1, 2, 5, 7, 12, 20, 21, 23, 26, 31), replacement of the outdoor water supply network for four academic buildings (№№2, 19, 20, 21), replacement of sanitation risers, repairing of toilets in two buildings (№№19, 22), replacement of internal water supply network of three buildings (№№12, 18, 19), installation of 5 fire hydrants, capital repairing of switchgear room of the dormitory №13, reconstruction of individual heating unit in dormitories №№ 8 and 22, finishing the roofs repairing of educational building №4, installing energy efficient windows in academic buildings and dormitories, and others. In conclusion I would like to express gratitude to the staff of the Department and the University for rational work to maintain the asset complex of the University in a proper maintenance and condition.